Roesch Ford in Bensenville, IL is pleased to announce the arrival of the 2017 Ford F-350 Super Duty Platinum Truck. Redesigned from the wheels up, the Super Duty 350 model includes a beefed-up frame, a more powerful engine, a more spacious cabin, and many convenience and technology offerings that make your life easier. The 2017 Ford F-350 line-up has larger frame rails and crossmembers that are made of 95 percent high-strength steel. Greater hauling and towing abilities are made possible by an integrated hitch receiver that extends farther into the frame. You’ll appreciate the fact that you no longer need to use a special weight-distributing hitch, and now you’ll get on the road faster and more efficiently. The recently arrived four-wheel drive model at Roesch Ford carries a turbocharged 6.7-liter V8 engine that has been revised to produce more horsepower and torque than its predecessor. Trips will be easy with the six-speed automatic transmission, power steering, fully automatic headlights, and brake assist, as well as comfort features such as driver lumbar support, telescoping steering wheel, and rear step bumper. Safety features include traction control, electronic stability control, low tire pressure warning, and dual front impact airbags. Off-road capabilities give you 8.2-inch ground clearance, an 18-degree approach angle, a 21-degree departure angle and a ramp breakover angle of 22 degrees. 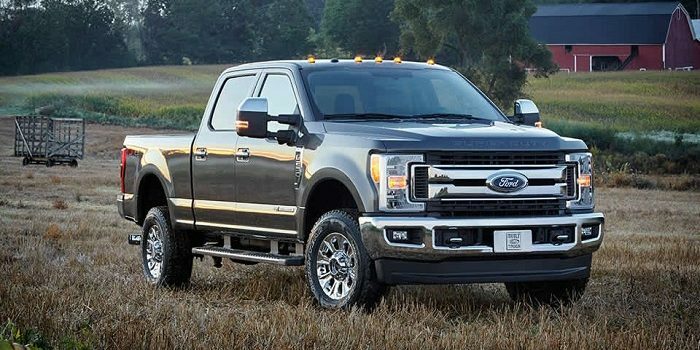 Add seating capacity for six, a split-bench rear seat, a front center armrest with storage, more storage in an overhead console, and can’t-live-without front beverage holders, and you’ll find that the 2017 Ford F-350 Super Duty Platinum Truck is one very desirable machine. At Roesch Ford, we’re excited about this impressive new truck. We invite you to stop by and check it out for yourself. We’re conveniently located at 333 West Grand Avenue in Bensenville, IL, just north of Hwy 20 and the Eisenhower Expressway. We’ll be happy to see you!